Foster care applies to a system in which a minor, someone under a certain age indicating adulthood, is put into an institution, group home, or private home of a foster parent. Adoption refers to the legal act of a parent or parents other than the birth parent providing permanent care for someone under the age of 18. Adoption can take place within the United States or internationally. However, there has always been some controversy among trans-racial adoptions in the United States, arguing a lack of preparation of white families in dealing with racism but on the other hand, the higher volume of white families that are seeking to adopt. In 2017, the majority of oversea adoptions by United States families were from China. Such international adoptions in the United States follow the Hague Adoption Convention that designates the requirements for adoptions between two countries. Outgoing or emigration adoptions in the United States were commonly undertaken by families living in Canada or in the Netherlands in 2017. Foster care and adoption regulations also differ across the United States. There are certain requirements that adoptive or foster care parents must meet in order to acquire a license, for example, owning or renting your own house or apartment, complete a training program and orientation, and having enough income to support your current household without relying on foster care reimbursement. Along with certain regulations, long wait times and high costs may often discourage adoptive families from adopting children, especially on an international scale. 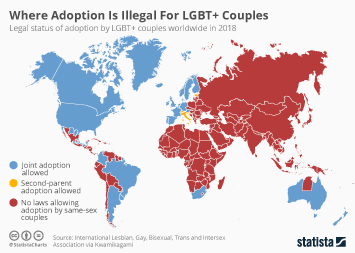 Recently, governments around the world have made it more difficult to adopt and some countries like Russia have even banned adoption for families in the United States. Within domestic adoptions, there are several options available for the families to proceed, such as through public agencies, licensed private agencies, independent adoptions, and facilitated or unlicensed agencies. Children under foster care in the United States vary by age, with mostly very young children, under the age of 3 and those in their late teens being placed under foster care. However, a child leaving foster care in the United States is also common, especially through reunification with parents or their primary caregivers. Adopting children from foster care is also an option for families in the United States. Adoption subsidies are often provided to encourage families to adopt children with disabilities. Low-income families may also qualify for adoption grants or loans from some financial institutions to fund the adoption process. Subsidies are provided to almost 90 percent of children adopted from foster care in the United States and can be received until the child turns 18 years of age. These types of assistance programs vary based on the state. Topic: Parents in the U.S.
Topic: Babies in the U.S.
Topic: Kids in the U.S.